Summary: "F.Z.Z.T." - When floating bodies turn up, Coulson and the Agents of S.H.I.E.L.D must hunt down an elusive killer. No one is safe--not even the team--on "Marvel's Agents of S.H.I.E.L.D." Does “FZZT” mean anything to anybody? Makes an interesting title. The sound of it in my head, coupled with the pic in the Marvel article immediately made me think of Fitz, but there is zero in the description to back that up. I was about to say that I’m hoping that Agent Sitwell or “Benny” should make an appearance to tie in ‘Item 47′ (it will also be pretty neat when the team faces a super, they can call on the alien tech). Happy to see Agent Blake though! Item 47 was set just a week or two after Avengers, and it appears then that Blake thought Coulson was dead. And there were no details in the one-shot to guess what his clearance level was/is. Will we perhaps get to see someone’s reaction to Coulson’s status? Titus Welliver always seems so composed, his reaction might be pretty interesting! Scouts 1-5 are played by kids, so it sounds like we’ve got a scout troop involved. Perhaps they come across the dead bodies? Poor little boys, scarred for life. Well I think this episode will be the “Halloween special” of AOS. Little bit scary. Good crying could be a good thing. We’ve had lots of action and lots of humor. I’m looking forward to a plot that can make us cry (and good crying means nobody dies…yet). Emotional range from a show is good, shows they have staying power. It sure is, I just compared it with hi rez screenies from Avengers. So there’s obviously something causing some serious distress to our main characters in this episode, judging by the promo – those are some pretty sad and/or pained expressions we see.. anyone got any thoughts as to how this ties in with the Chitauri helmet and floating people/objects? Well, one scene makes me weep. The question now is about the cast. In the next episode Simmons is still present but I don’t know if the cast, in the prewiew, are filled by default or not. In fact the preview of the episodes are petty spoiler. was waiting for an episode that is somehow tied in with marvel films.. was thinking that this is one due to involvement of chitauri helmet and the floating bodies… now that makes me excited with the tie in episode with captain america movie… that would be FANTASTIC!! When we read the description a couple weeks ago I assumed that “floating bodies” were in water, like a river. Not actually floating! (Guess that’s what I get for assuming anything ) The floating looks a bit like the floating truck we see in the Thor: Dark World trailer, and this episode airs just a few days before the film (in the US), but nothing from the trailer seems to connect the two and I’m guessing it’s a coincidence. In Item 47 Agent Blake was involved with the collection or handling of Chitauri items left from the Battle of New York. And with a Chitauri helm featured in the promo I’m guess that’s why Blake is called in. The question is whether the helm has something to do with the floating? And I don’t even want to talk about why they look so sad. That does NOT look like good crying to me! I’m not sure I can take waiting 2 weeks!! Kinda seems to be an acronym (which they love on the show — see their cast chairs), but what phrase in the world could have two Z words?! maybe its a code just like the 0-8-4. but the idea on having details about fitz in this episode is still possible. Anything with two Z words in it is automatically awesome. I happen to know Z is the best letter in the universe. I’m banking on the fact that it’s so early in the season to save everyone – at first when I saw the trailer I thought Fitz was the one in danger? But looking again I agree that it seems to be Simmons. Also, this episode better be epic. After waiting so long for it, I want to see something AMAZING. 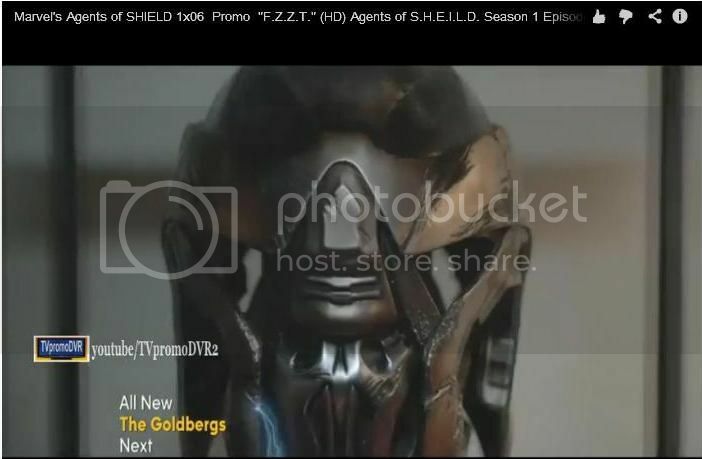 So the helmet looks like a Chitauri one..
And I think it will be a THOR tie-in. The floating bodies are a lot like the ones from the Thor preview trailer…. Having just seen Thor, the floating bodies thing IS technically feasible but I think unlikely. Is Thor 2 out yet? The Chitauri have some kind of anti-gravity tech and since we have seen the helm I would guess the episode is related to research into that. I’m sure of course we all know that after the battle of NY S.H.I.E.L.D as well as the rest of the world are preparing for threats from outer space and other dimensions. Good to know they are researching the tech the Chitauri had in order to prepare steps ahead. was it not confirmed here /spoiler-wi…..-h-i-e-l-d that episode 6 is a tie-in? the chitauri helmet is also confirmed as chitauri tech. f z z t could also refer to the sound electricity create on the floating bodies. like a fried computer chip. we may also be able to found out more about coulson and fitz. That article you linked discusses episode 8, not 6. We don’t know anything about episode 9 yet. what is the first tie in episode then? Agents of S.H.I.E.L.D. will get its second major tie in with the Marvel Cinematic Universe’s Phase Two films on November 19th with the episode entitled ‘The Well’. There was a classic Hulk villain called Zzzax that was composed with pure electricity and feeds on static electricity of his victims. I hoped they would use it as a villain, but i see i was wrong. That would be cool if he was on there. Or the Villian Half life. I believe he was an enemy/Villian of the Hulk too, or was that just in the Hulk game? They were two, one from east coast Avengers, and another from the Hulk.